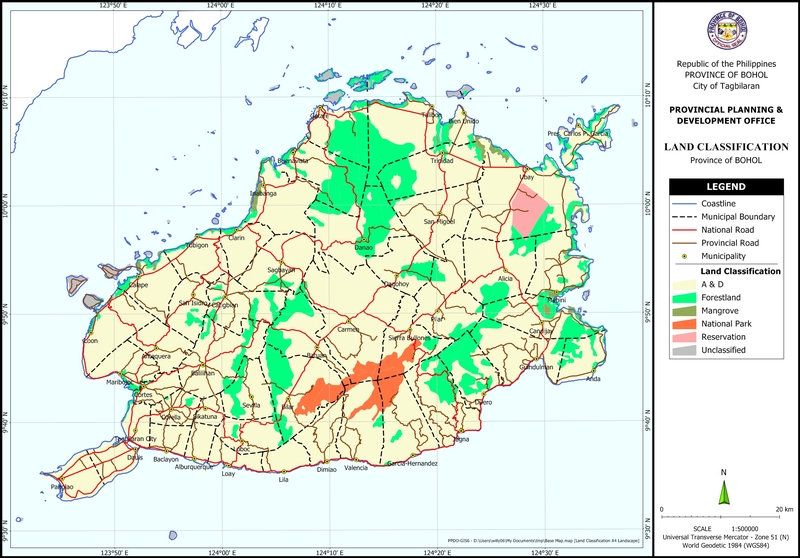 The Land Classification Map shows areas classified as: Alienable and Disposable Land, Forest, national Park, Mangrove, and, Reservation Areas. The Land Classification was acquired from the Department of Environment and Natural Resources (DENR). Base map features were digitized from the National Mapping and Resource Information Authority (NAMRIA) Topographic Map sheets scaled at 1:50,000 using heads-up digitizing method. Forest land occupies 101,271 Hectares as indicated in the current PDPFP. However, you may have to confirm this with DENR because there might be changes already. I am a student of the university of the Philippines, working on my thesis, with Panglao as my site. Would it be possible to request for a map which shows the lot divisions in Panglao Island? Specifically around the Alona beach area. Any help would be greatly appreciated, thank you! We’re sorry but the PPDO does not handle such data. Perhaps it would be best to visit the Municipal Assessor’s Office of Panglao and Dauis, as these two municipalities are on the Island of Panglao.